When you select any of the three new Blur filters in Photoshop CS6, you will also access two associated control panels, Blur Tools and Blur Effects, which contain your options. All three filters enable you to create special effects. Field Blur: Creates an overall blur on your image. By adding additional control points, or pins, you can create gradiated blurs from sharp to blurry. 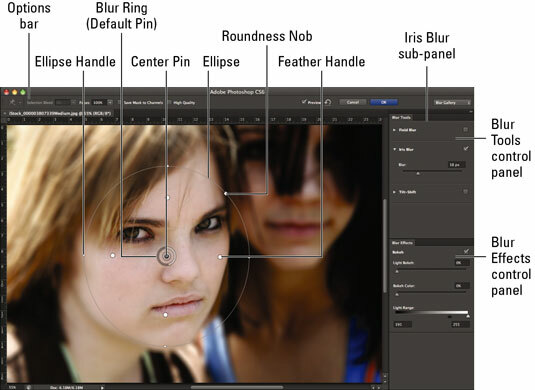 Iris Blur: Creates a vignette focus where a circular portion of your image remains sharp while the rest becomes blurred. Tilt-Shift Blur: Creates a blur where the middle is sharp and the top and bottom (or left and right) becomes blurred. Choose Filter→Blur and select Field Blur, Iris Blur, or Tilt-Shift Blur from the submenu. 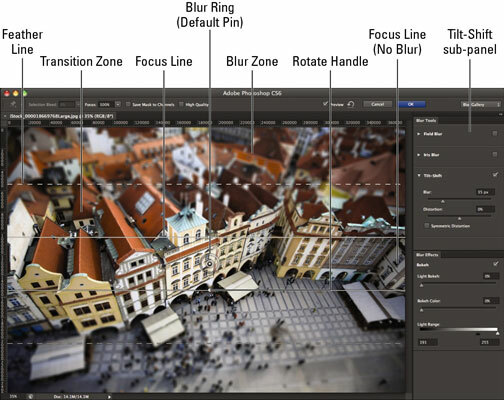 In the Blur Tools control panel, adjust the amount of Blur you desire. Note that you can also adjust the Blur amount by dragging the white portion of the Blur Ring. If you have chosen the Tilt-Shift blur, you may also adjust the amount of blur distortion. The distortion value only impacts the lower blur zone. If you select the Symmetric Distortion option, you can apply distortion to both directions. On a Tilt-Shift blur, the area between the Focus line (solid) and the Feather line (dashed) is the Transition Zone, where the blur is feathered between not being blurry and being blurry with the full value you specified in the Blur option. You can check each blur in the Blur Tools control panel to turn it on or off. Adjust your effects in the Blur Effects control panel. Light Bokeh: Bokeh is a fancy name for blur, but has come to be more associated with the aesthetic quality of the blurred points of light or reflections in the image. In this case, the setting enhances those light areas. Bokeh Color: Specify the color of your bokeh. Zero percent is neutral, while 100% is most colorful. Light Range: Set which brightness levels (0 to 255) are impacted by the light bokeh. A smaller range seems to work best. Drag the center pin to relocate the center point of your blur. Add pins by clicking the cursor when it appears as a push pin icon. One pin on a Field blur blurs the entire image. You can add a second, or third, or more pins to create a more graduated blur. Select each pin and assign an ascending blur amount. Delete a pin by selecting it and hitting the Backspace key (delete key on the Mac). Adjust the size and rotation of focus by dragging the ellipse handles on an Iris Blur. On the ellipse of an Iris Blur, move the feathered edge by dragging the Feather handle. Press the Alt (Option on the Mac) key to move these handles independently. On an Iris Blur, make the ellipse more square by dragging the Roundness knob. On a Tilt-Shift blur, drag the Focus line to expand or reduce the area of focus. On a Tilt-Shift blur, drag in the center of the Focus line to rotate the focus area. On a Tilt-Shift blur, drag along the Feather line at any point to enlarge or reduce the transition area between focused and blurred. Selection Bleed: If you have created a selection before selecting a blur, you may indicate how much the selected area will blend and bleed with your unselected areas. Focus: This option preserves the non-blurred area of a specific pin when you have multiple pins. This is a per pin setting. Save Masks to Channels: Select this option to create a channel mask/alpha channel that contains your blur mask. Preview: Click Preview to toggle the view between your original and blurred image. Remove all pins (curved arrow icon): Click this option to delete all of your pins. To remove a single pin, select it and press the Delete key. Cancel/OK: Click to either cancel or accept the blur. Note that it may take Photoshop a couple seconds to process your blur, especially on a large image. If you like the ways things look, click OK in the Options bar. If not, press Cancel in the Options bar, or hit Esc, to bail out.